Junior Nicole Gibbs captured the NCAA singles title over Nebraska’s Mary Weatherholt 6-2, 6-4 on Monday, successfully defending her title to become the first repeat NCAA singles champion since Stanford’s Amber Liu ’06 in 2004. After the match, Gibbs announced she would be foregoing her senior season to begin her professional career. Gibbs, who led the Cardinal to a team NCAA title last week before cruising through the individual tournament without dropping a set this week, is the second Stanford player in history to boast an NCAA team, singles and doubles title. Gibbs defeated former teammate Mallory Burdette ’13 in the finals last year to win her first individual title. But it wouldn’t be her last. The All-American won six straight matches to hold onto the crown. All the focus was on singles as both of Stanford’s doubles teams were eliminated in the first round. The duo of Gibbs and junior Kristie Ahn fell to Tulsa’s Isaura Enrique and Samantha Vickers 6-2, 6-4. Senior Stacey Tan and sophomore Ellen Tsay didn’t have much luck either, losing to Lauren Embree and Sofie Oyen of Florida 6-3, 2-6, 6-4. In the first round of singles, No. 13 Gibbs defeated No. 47 Yang Pang of Arkansas 7-5, 6-4 in the tightest match of her run. Ahn, who clinched the team title for Stanford last week in a spectacular match, fell to Kansas State’s Petra Niedermayerova 6-2, 6-1. Freshman Krista Hardebeck won her first NCAA singles match over Pleun Burgmans of Auburn 4-6, 6-3, 6-4 to move into the second round. Stanford’s representatives had continued success in the second round as Gibbs breezed past Michigan’s Ronit Yurovsky 6-4, 6-4, and Hardebeck beat Virginia Commonwealth’s Cindy Chala 1-6, 7-5, 6-4. That was the third time in her last four matches where Hardebeck lost the first set only to win the match. The Round of 16 marked the end for the freshman All-American. Hardebeck couldn’t get past No. 6 Laura Herring of Georgia, who won the match 6-0, 6-2. Gibbs really started to gain momentum in the Sweet Sixteen. In a repeat matchup from the team championship days before, she played Texas A&M’s Christina Sanchez-Quintanar. In their first meeting, Gibbs was shut out for the first time in her collegiate career in the first set but rallied back to win twelve straight games and take the match 0-6, 6-2, 6-0. This time around was easier for the NCAA champ, who beat Sanchez-Quintanar 6-4, 6-4. Play seemed to get only easier for Gibbs, who defeated No. 16 Yana Koroleva of Clemson 6-1, 6-1 in the quarterfinal, No. 31 Breaunna Addison of Texas 6-1, 6-1 in the semifinal and Weatherholt in the final, losing only a combined 10 games over her final three matches. 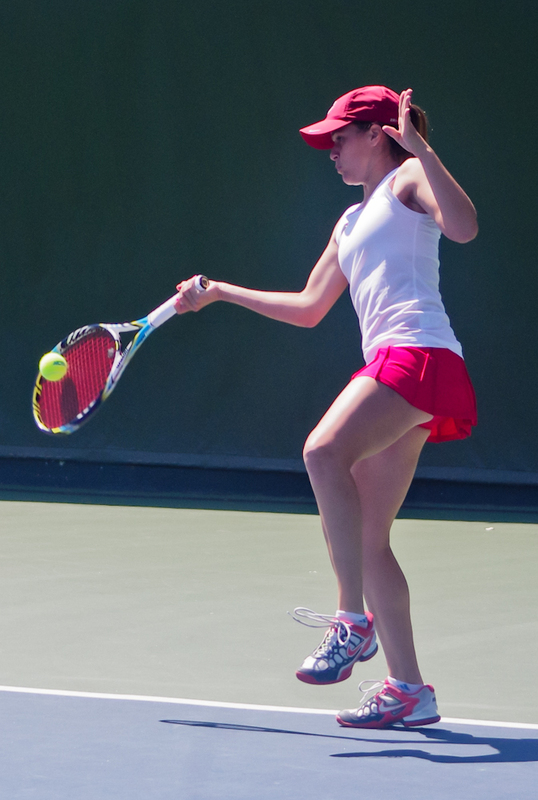 Gibbs’ victory in Monday’s final marked her last match as a Stanford student-athlete. Gibbs will skip here senior season on the Farm to enter the pro circuit, just as her teammate Burdette did last year. Gibbs will leave Stanford as a two-time NCAA singles champion, a Pac-12 champion and holder of a 111-15 overall record in match play. Like Gibbs, Hardebeck entered Stanford as a No. 1 recruit and considered turning straight to the pro circuit after high school. Hardebeck will return for the Cardinal next year. Gibbs’ victory marked the official end of Stanford’s season, but the Cardinal will be back without Gibbs, Tan and senior Natalie Dillon next year as it tries to repeat the success of its championship season. Contact Chrissy Jones at chrissyj ‘at’ stanford.edu.